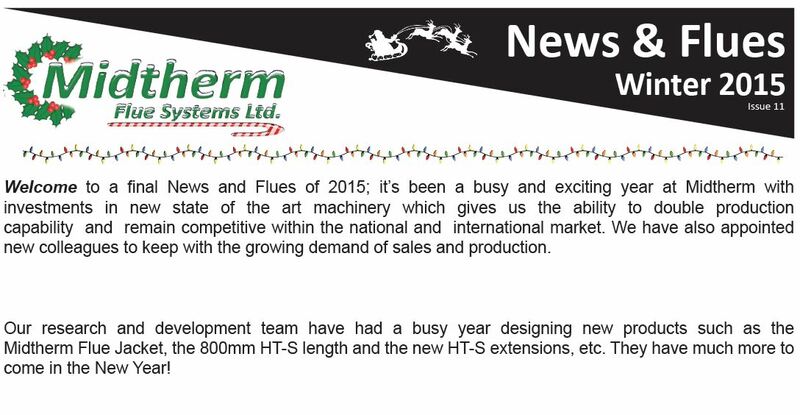 Welcome to a final News and Flues of 2015; it’s been a busy and exciting year at Midtherm with investments in new state of the art machinery which gives us the ability to double production capability and remain competitive within the national and international market. We have also appointed new colleagues to keep with the growing demand of sales and production. Our research and development team have had a busy year designing new products such as the Midtherm Flue Jacket, the 800mm HT-S length and the new HT-S extensions, etc. They have much more to come in the New Year! 2015 has seen another successful year of external quality audits, with outstanding results from both ISO 9001:2008 and CE Marking, the company enjoyed very positive feedback from both external. Our quality team continue to focus on continued improvements for both product and customer service for the coming year.